Coffee table does not need to be expensive. There are those that come with amazing quality and design with affordable price tag. For most people, budget is a priority when choosing a coffee table. 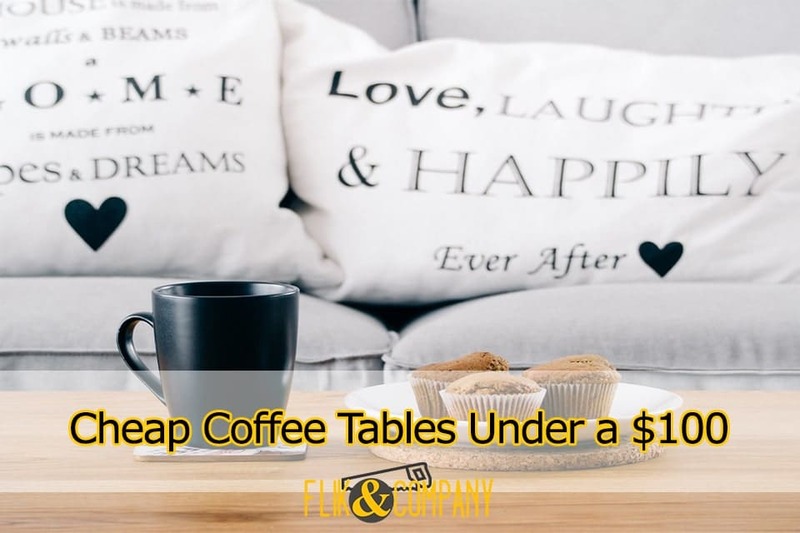 If you happen to look for inexpensive ones, then this list of 40 cheap coffee tables are worth looking for. Note that these are not crappy coffee tables for a one time use. These are priced for under $100. Your budget means a lot! 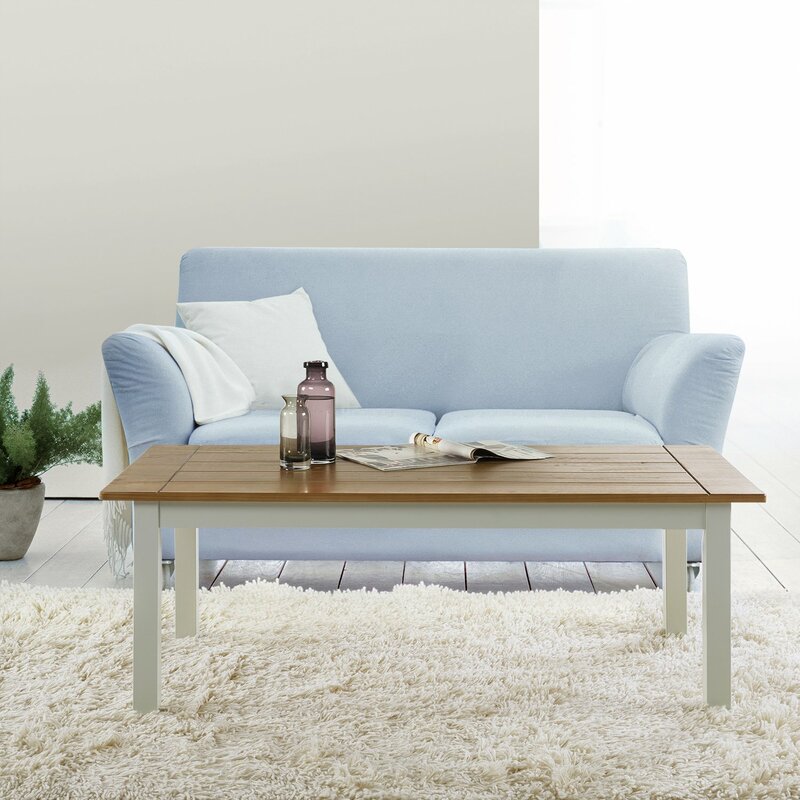 A coffee table is a low table placed next to or in front of sofas, armchairs, and whatnot. It is designed to support beverages, books, decorative items, and other small items that may be used when sitting. These tables are frequently used to support coffee cups, hence their name. This egg-shaped coffee table from Great Deal Furniture is a great addition for living room with round corners. 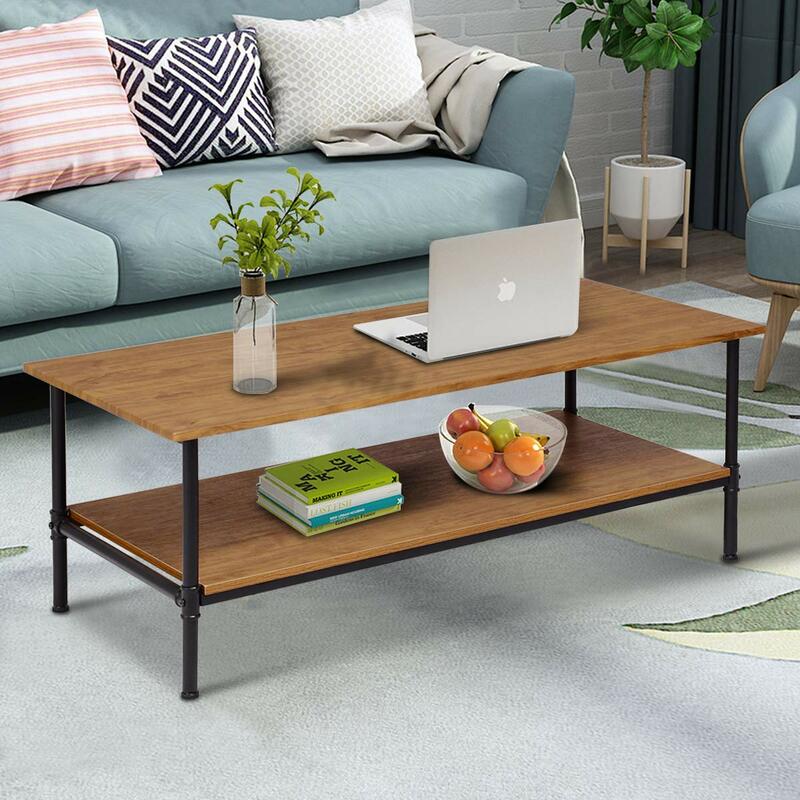 This mid-century design coffee table is not just affordable (under $70), but its minimalism is a great choice for most home owners. Its walnut finish also adds a warm feeling in your living room. Boasting a vintage wood finish with quite a simple design, this coffee table could fit many interiors. Its mesh shelf has a bit specific looks though, so you would need to make sure that it fits your room. Who doesn’t like some storages in your living room? This Naomi Mid Century Modern Finished Fiberboard Coffee Table has two drawers where you can put your stuffs like magazines, books, remote control and many other things. The base of this coffee table is made with rubber wood which doesn’t add much weight on this coffee table, hence making it lighter to move around. Colors are available in Gray Oak, Wenge, or Wenge/Gray Oak finish. 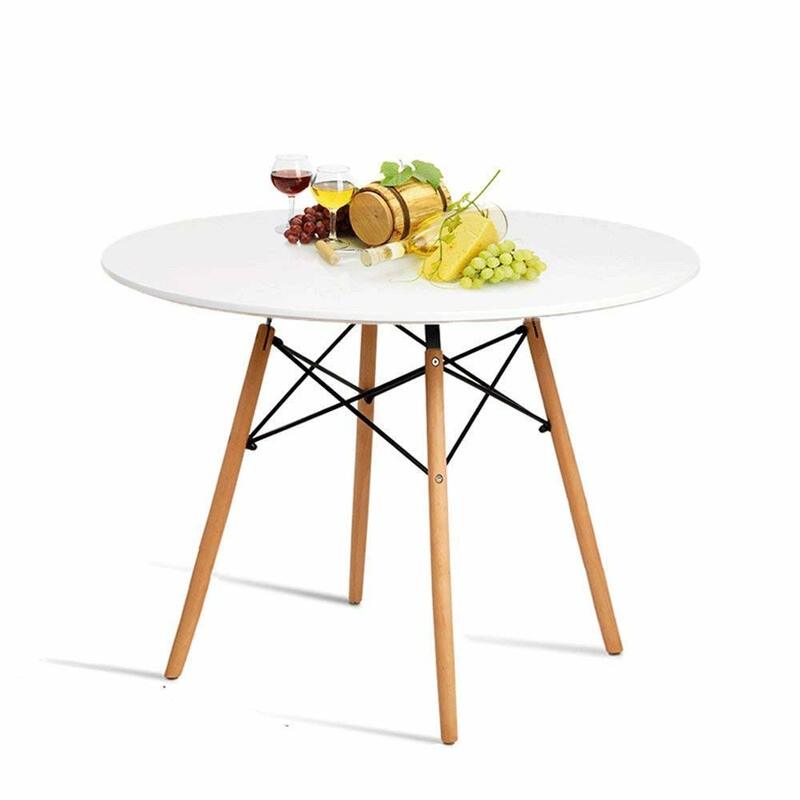 You can get this table under $92. 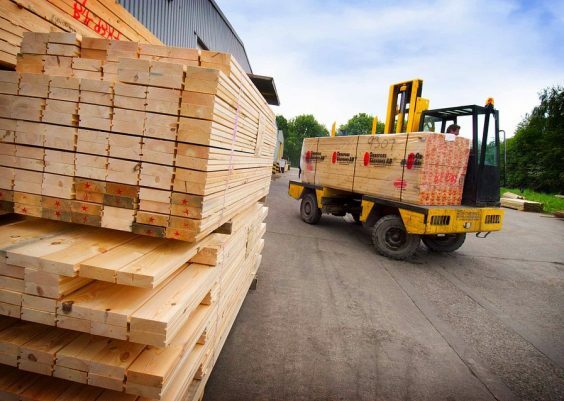 Acacia wood is one of the many wood material often furniture buyers seek out because of its sturdiness. This coffee table is an example. 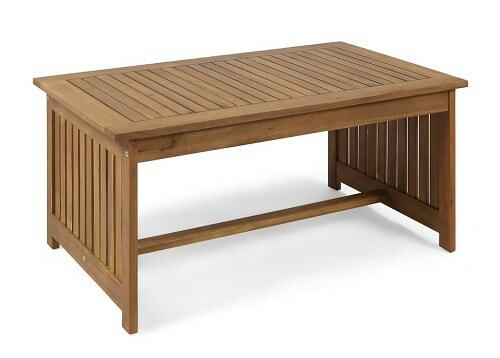 The simplistic farmhouse design and teak finish makes it a great coffee table addition for most interiors and even fits on patios and backyards. Considering its material and price point, this coffee table is not a crappy one. 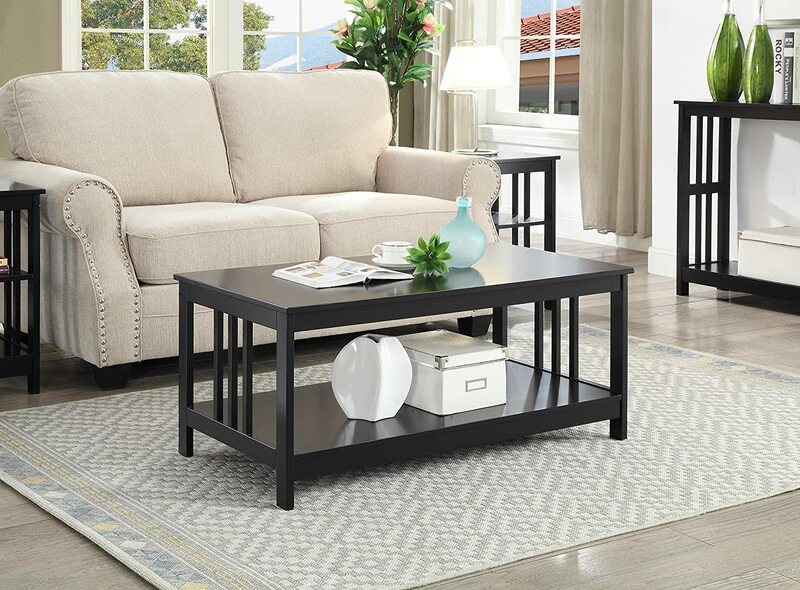 With a more simplistic oak finish and wooden shelf supported by a metal frame, the Sauder coffee table could be compatible with a wider range of furniture styles. 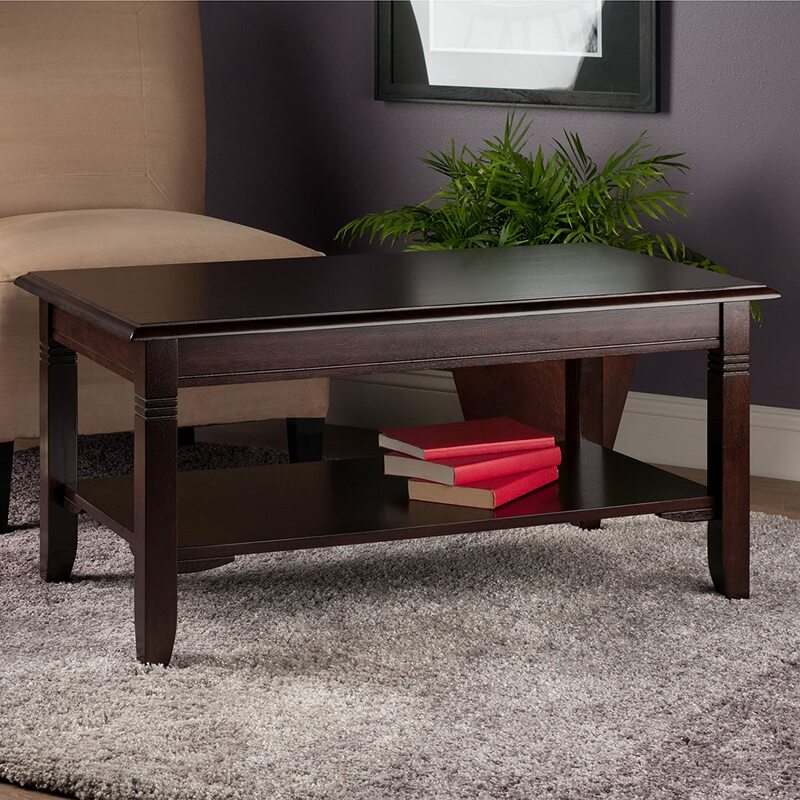 The combination of the stylish, modern design of this sturdy table and the slightly glossy brown wood grain finish make this table a good choice if you want a sleek coffee table. 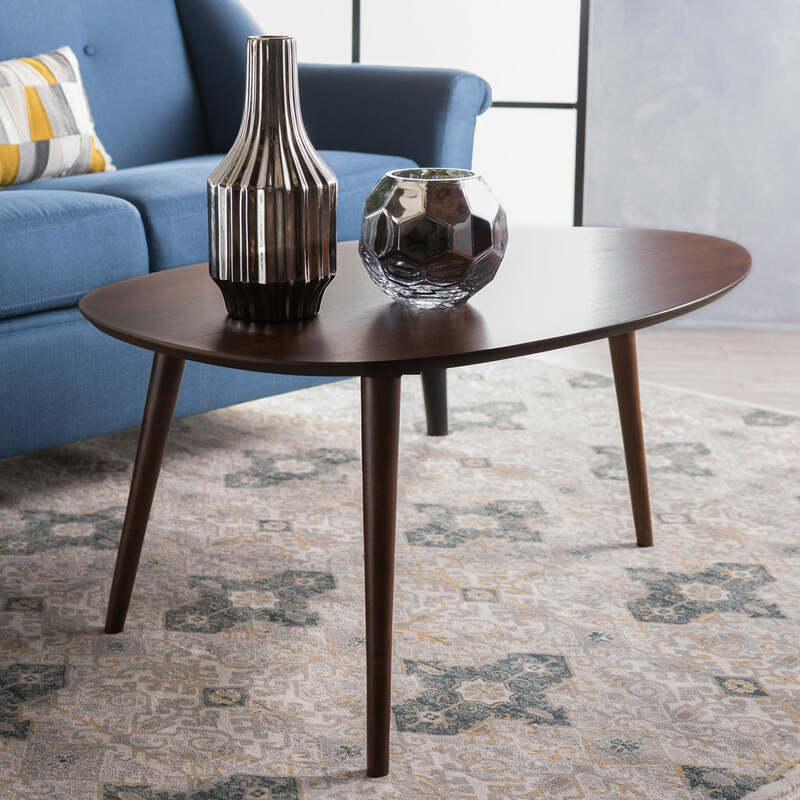 With its carved and curved legs and dark cappuccino finish, Winsome coffee table offers a vintage appearance that would fit well with non-modern furniture. Having the vintage curved legs of the previous Winsome coffee table and a sleeker design with a glass top, this Winsome coffee table could be a good choice for both modern and traditional interiors. 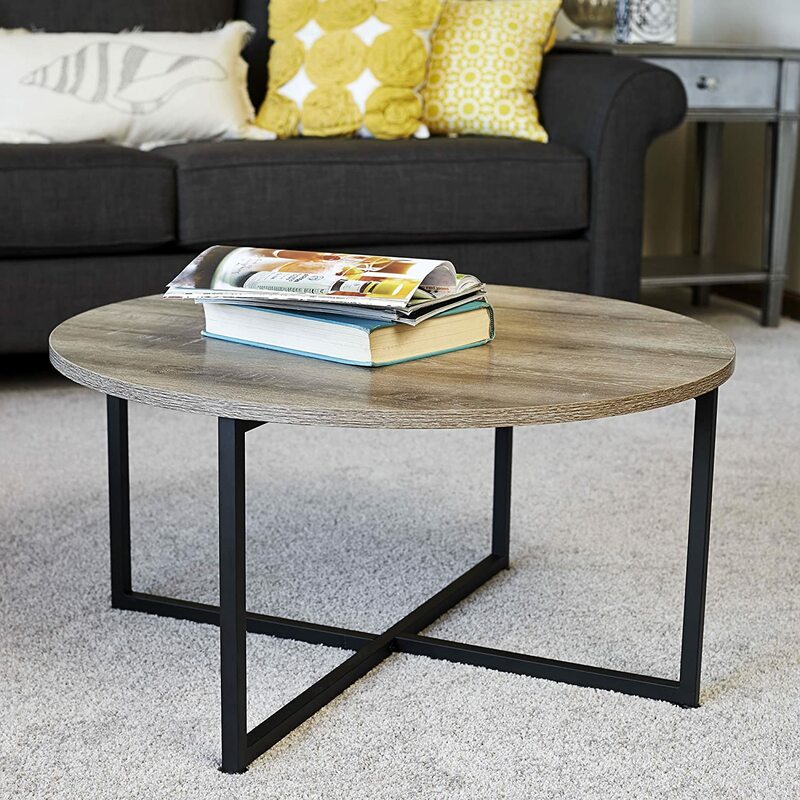 This round table with a metal frame and a worn-out gray-toned wood finish with a slight gloss could be a good choice of a sleek and modern coffee table if your furniture has a lot of curves in it. 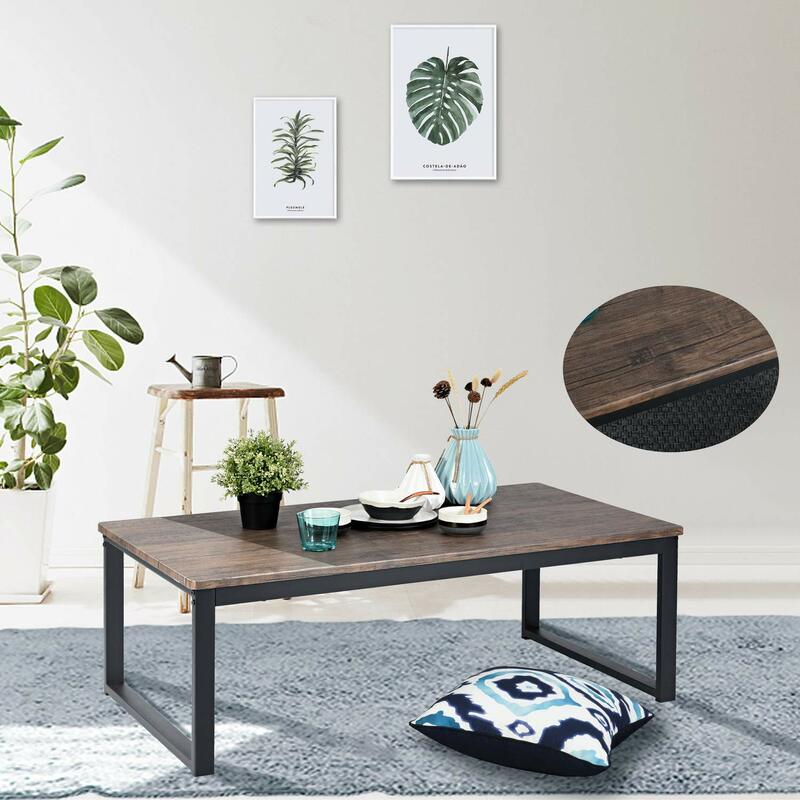 If you are looking for a minimalist coffee table, then you might like Aingoo Rustic coffee table for its simple yet elegant design and the matte textured wood finish. 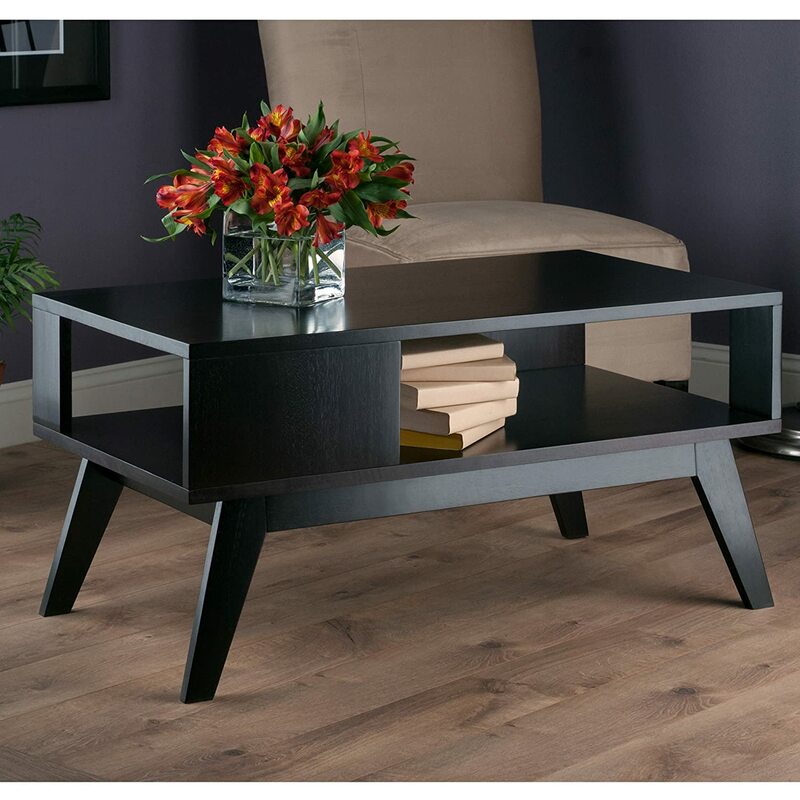 With a scratch-free glass top and shelf, as well as gloss black legs, the modern feel of this table can be topped off by not so many tables on our list. 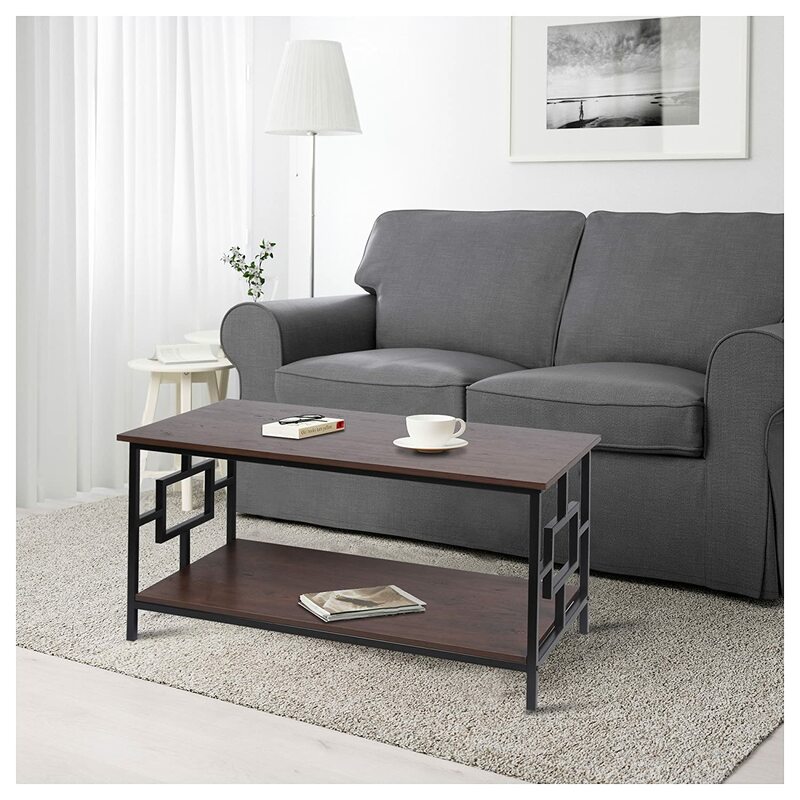 With a glossy faux marble top finish and the medium brown legs with metal cross bar, this Giantex coffee table could greatly complement a room with predominating bright colors. This white-finish wooden coffee table would be a nice choice for a terrace or maybe a room with a plentitude of wooden elements. 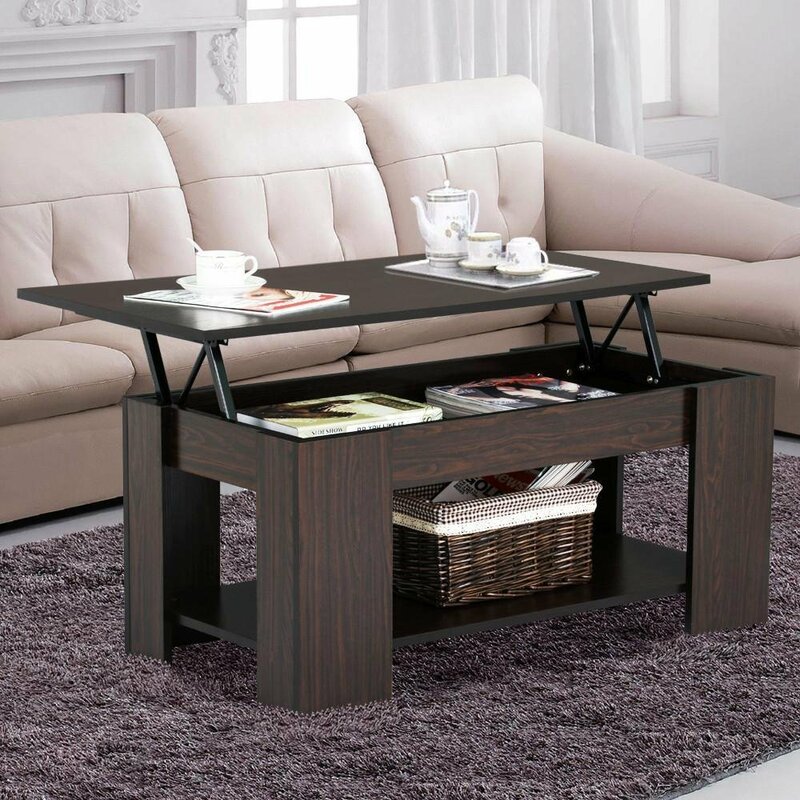 Thanks to its minimalistic design and the simple black finish, this coffee table could complement a wide range of furnishings, even more so if you have other pieces of furniture from Convenience Concepts Mission collection. This treated and stained acacia coffee table could also be a good choice for virtually any patio thanks to its simplistic design, but it is its brown patina color that may catch your eye. With its abundance of curves and slanting top edges, as well as the walnut finish, this table would make for a great decorative piece for a living room. 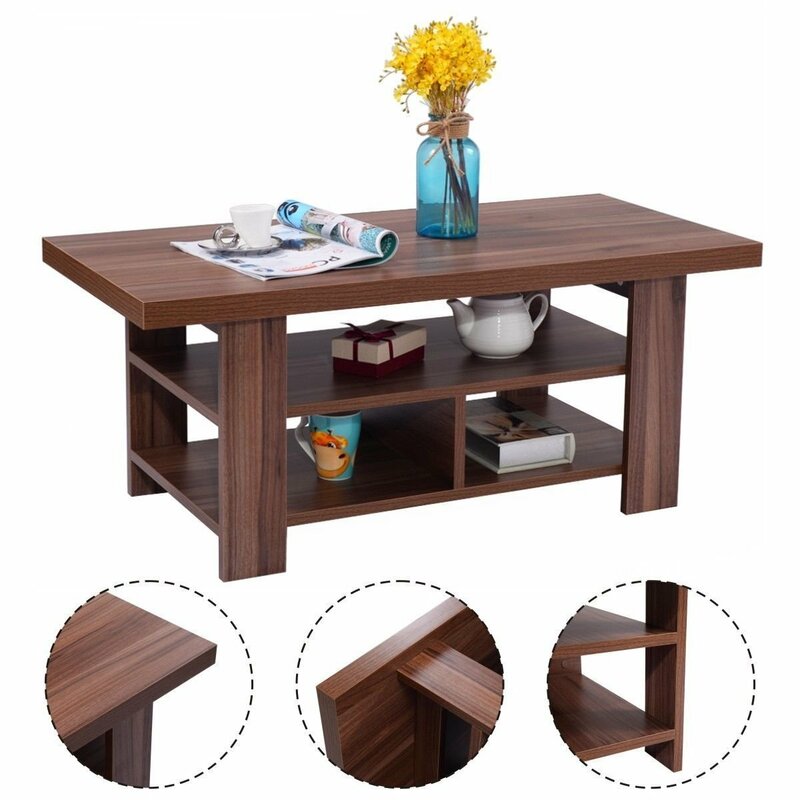 Looking for a coffee table with large storage capacity? Then this Songmics table could be the right pick thanks to its spacious tabletop and lower shelf with plenty of headroom. 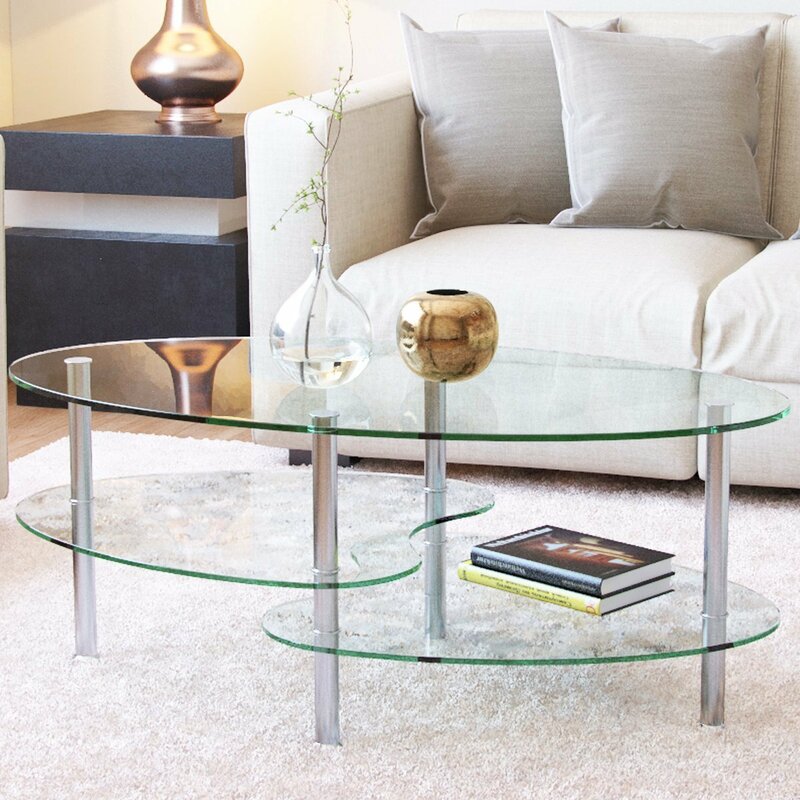 The abundance of glass in Ryan Rove Ashley coffee table certainly catches the eye. Besides being sleek, this table also has an interesting two level shelf design, which allows for slightly more efficient storage area use. Yaheetech coffee table truly is a functional table. It not only has a spacious storage shelf but also a lifting top with even more storage area beneath. The top lifts up and forward, so it could make reaching your items easier. If you are looking for a simple coffee table to combine with your white-accented interior, then DHP Parsons table could be the right choice. While GIA coffee table has a simple universal design with a faux wood top, its side cutouts could make it unsuitable for some interiors. However, if you happen to have furniture with a similar design, then this table would certainly complement it. 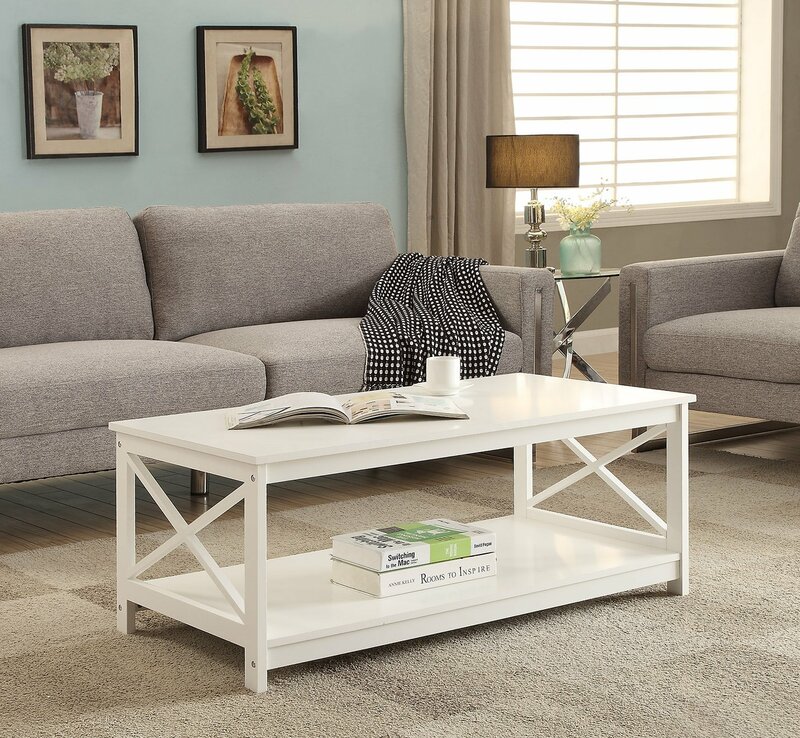 This coffee table could be the right choice for both indoor and outdoor use since it has rustproof legs and a stain-resistant top. 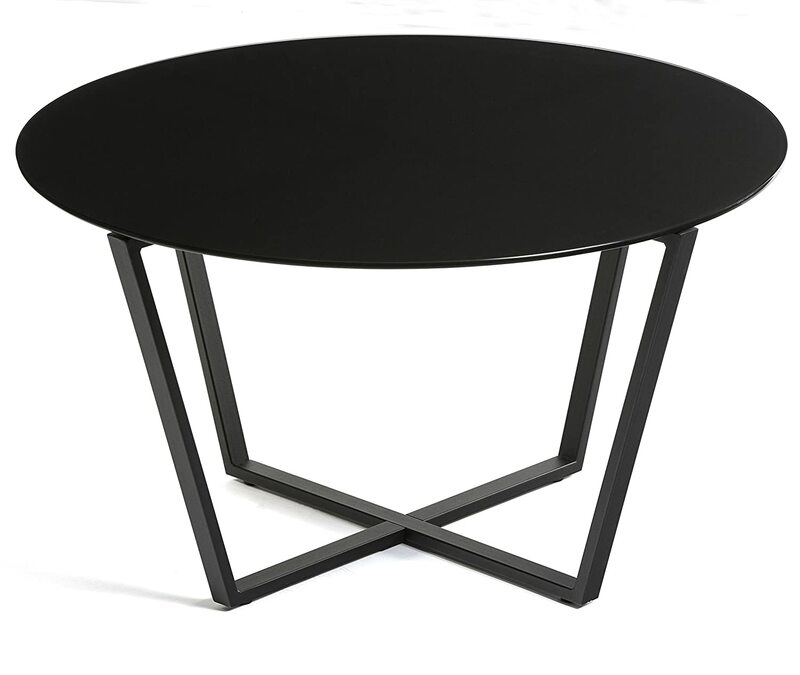 And thanks to its fairly minimalistic design, this table could fit many interiors. 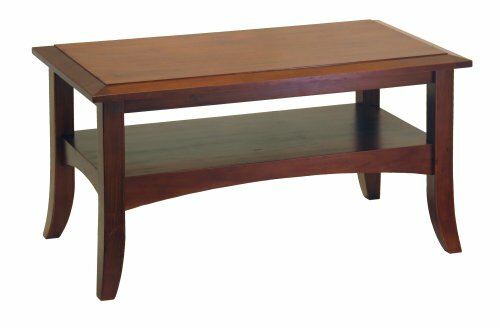 Ameriwood Home coffee table not only features a unique and modern design but also has two storage shelves. 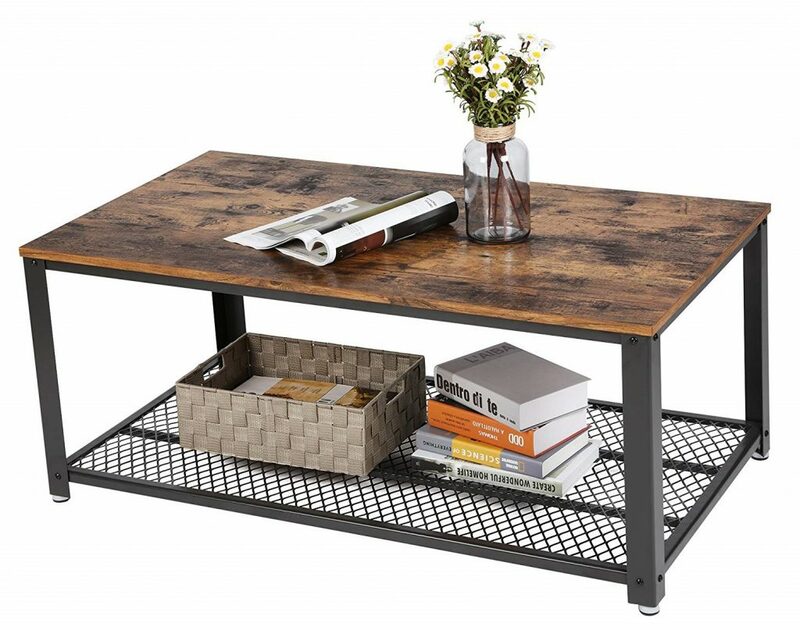 If you have a lot of items that need to be kept organized, then this table could be the right pick. 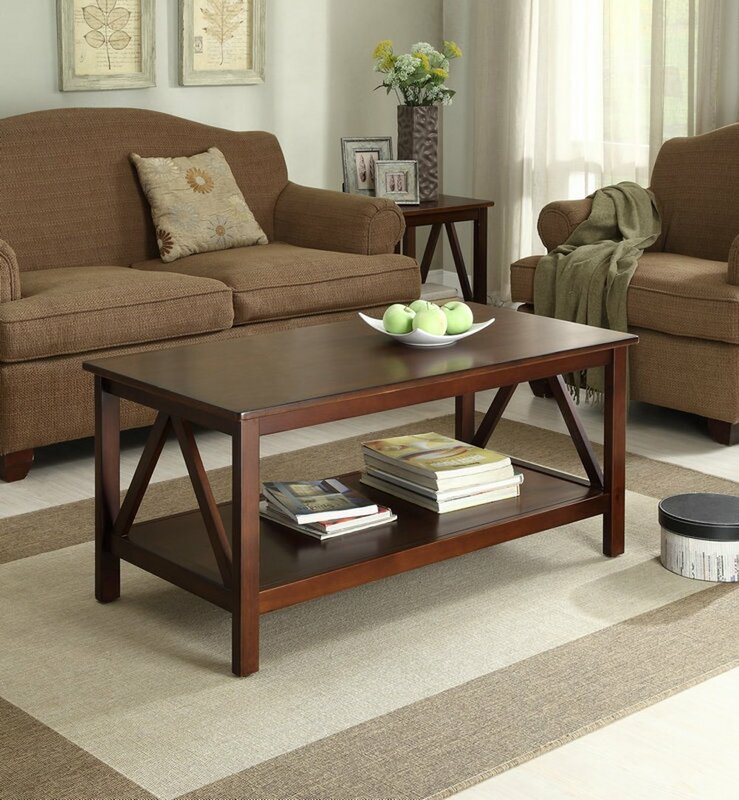 The fairly neutral graystone faux birch finish of this coffee table should suit a wide range of interiors. Besides, if you happen to have other items from the Graystone collection, this table would greatly complement them. 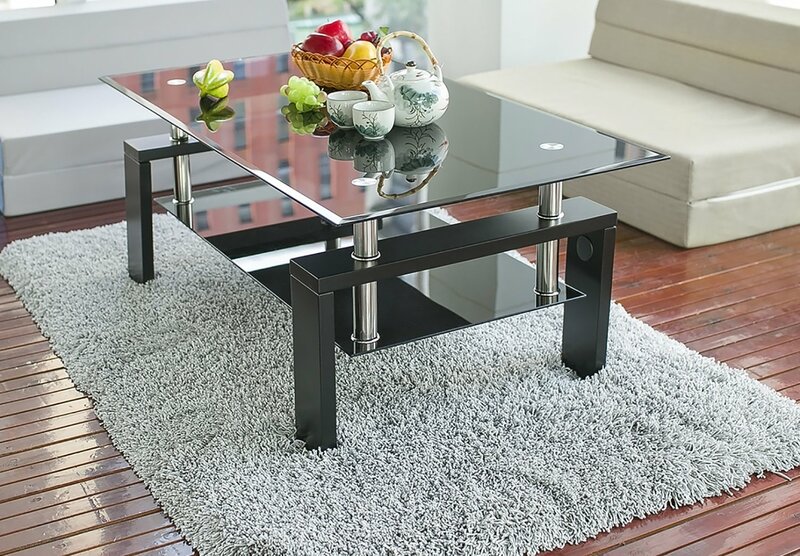 Linon Home Decor coffee table could also be a good choice if you are looking for a simple table. It features an antique tobacco finish and a bottom shelf. Even the side triangle inserts appear to not be very intrusive. This coffee table is pretty much identical to the Elevens table we examined earlier, but it seems to have some differences. This coffee table appears to have a scratch- and heat-resistant top, which could make it a better choice for outdoor use. The design of this affordable coffee table certainly is quite remarkable. What attracts me most is its 360 degree feet which means you can adjust it even if you have uneven flooring so that the table will be stable. Plus, it has pads so it won’t scratch your floor. 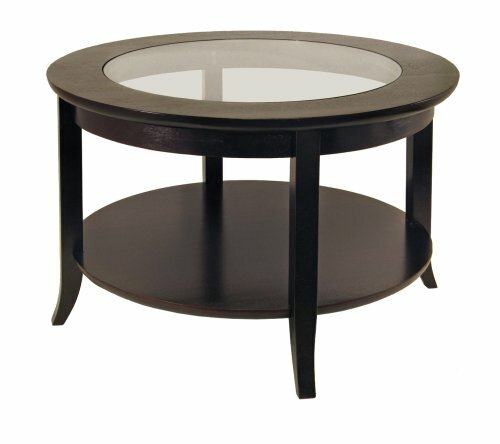 Round coffee tables typically don’t fit various interiors, but we think that Winsome round coffee table with its fairly modest design and a glass top would likely be compatible with your interior. 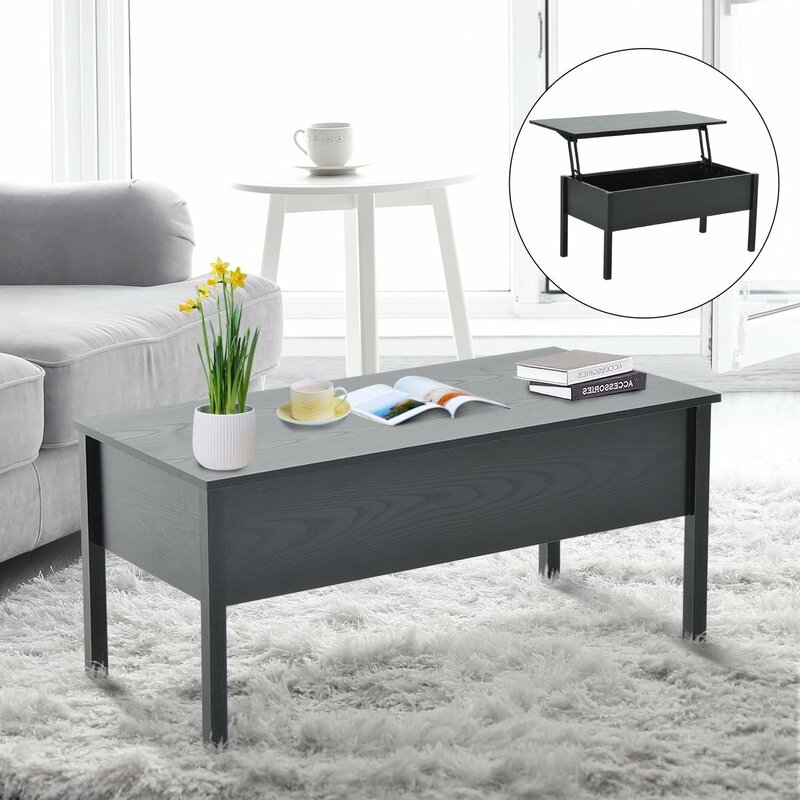 Zinus Farmhouse country-style coffee table certainly looks good and sturdy, and it could suit your interior if you like minimalist coffee table. 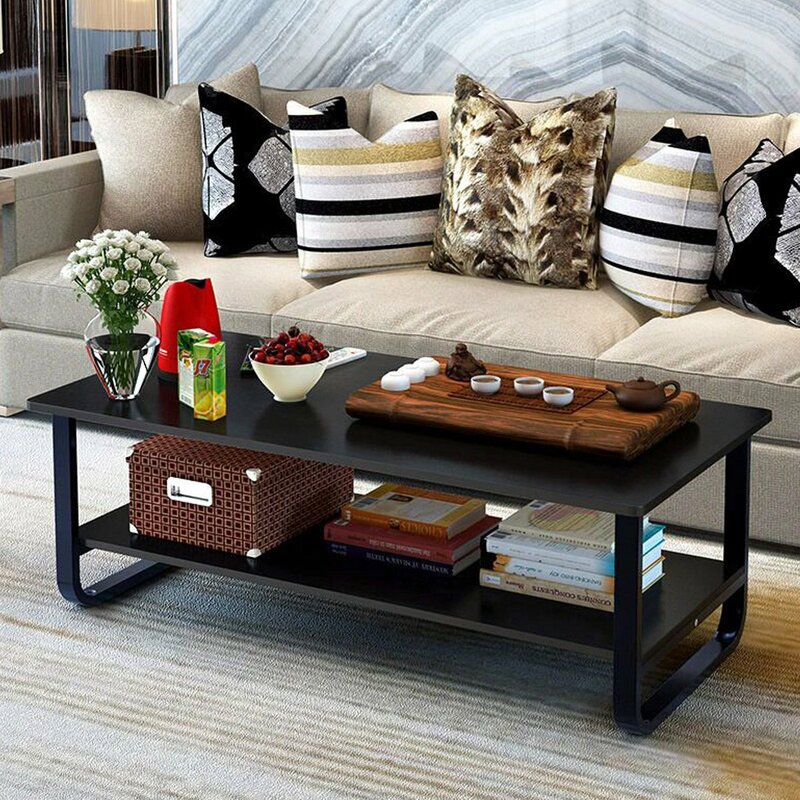 soges coffee table is actually a pretty multifunctional piece of furniture. It can be used not only as a coffee table but as a nightstand as well. If you are looking for a coffee table to put next to your armchair rather than in front, then this coffee table could be the right pick. 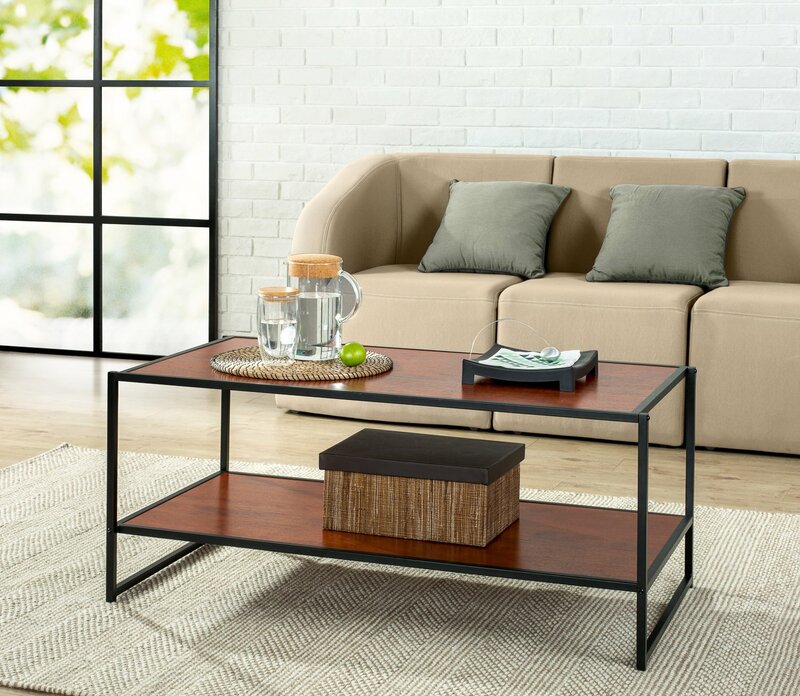 TANGKULA Rectangular Glass Coffee Table is similar to SUNCOO Coffee End Side Table which we reviewed earlier, except it has various wood color to choose from. 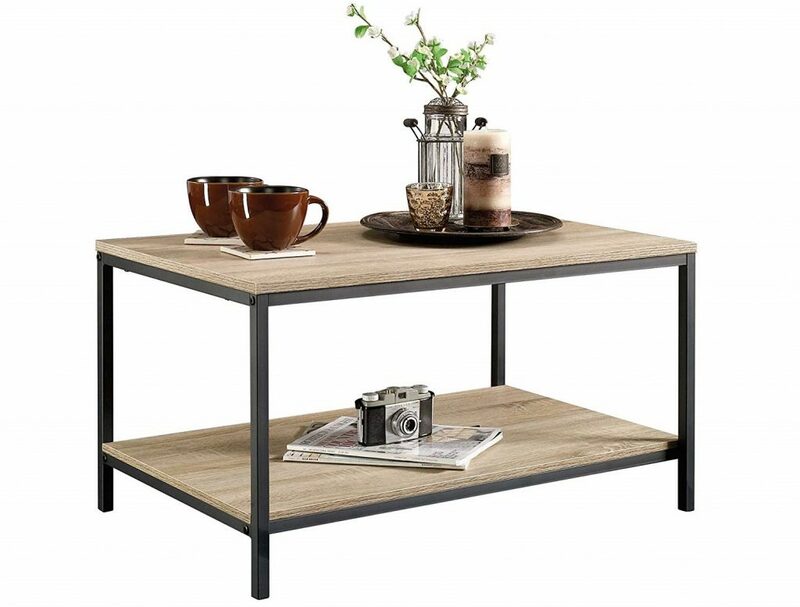 If you need a sleek decorative coffee table with no storage shelves, then the Topeakmart table would probably suit your needs. It features a tempered glass top, as well as chrome-finished legs. 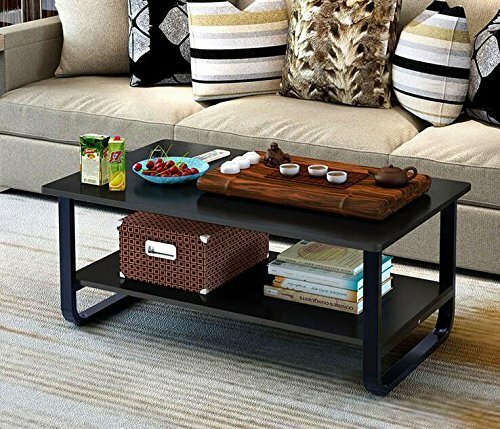 This Winsome coffee table has a spacious storage shelf. Add to that the midcentury modern design with wide off-centered openings on both sides of the table. 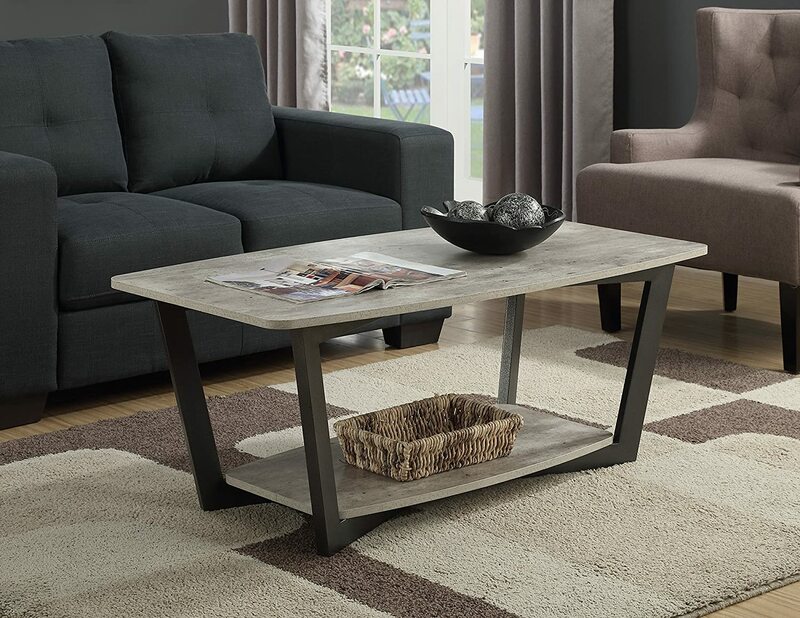 While this gray coffee table looks simple overall, its x-shaped side inlets could make it less suitable for some interiors. If you happen to have similar furnishing and design, then this table could be a great addition to your interior. 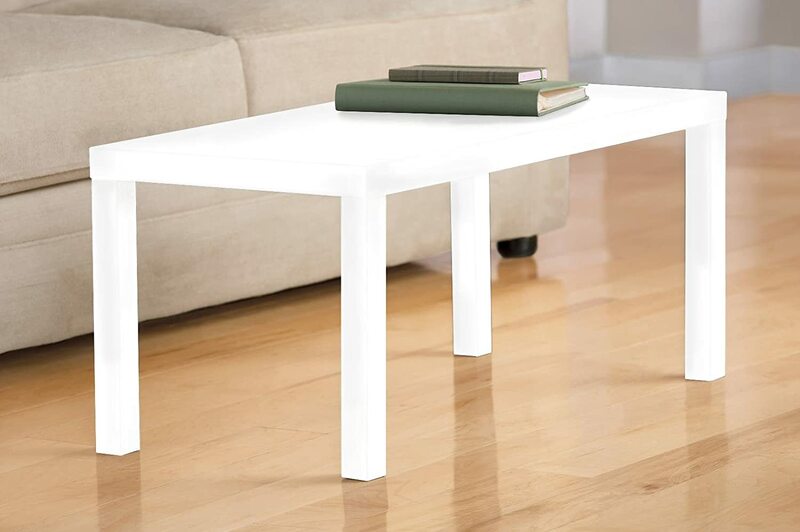 Giantex coffee table, first of all, features a thick and durable tabletop. Secondly, it has two storage shelves. 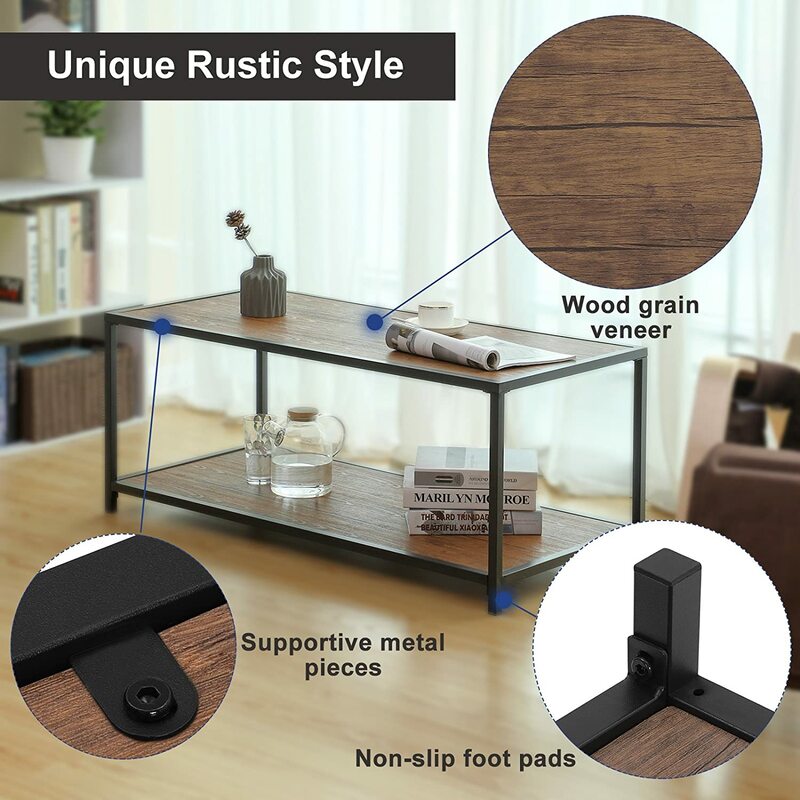 Possibly not the best-looking table on the reviews, this coffee table nonetheless could be a good choice if you want as much storage area as possible. 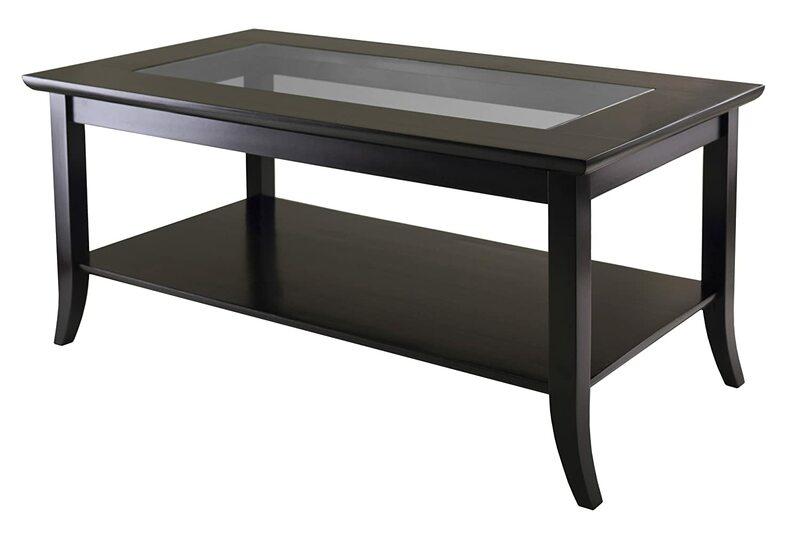 Possibly the most remarkable feature of this round coffee table is its tempered glass top. Add to that the light and unobtrusive design of the legs, and you get a coffee table that could be conveniently put next to your armchair. Primarily designed for kitchen use, HYhome round table could also be used as a coffee table. 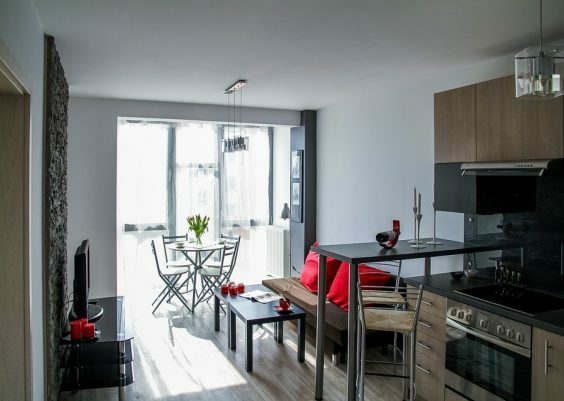 Its design doesn’t look intrusive and overwhelming, so it should suit a variety of interiors. Like the Yaheetech coffee table we reviewed earlier, this coffee table also has a lifting top. But this table’s top appears to come out much farther, making reaching items and your cup of coffee easier. Besides, the lifting top exposes a spacious storage compartment. This coffee table has quite a remarkable sleek, cappuccino-colored appearance. An integral component of its design is its decorative slatted shelf that would be suitable for large items. 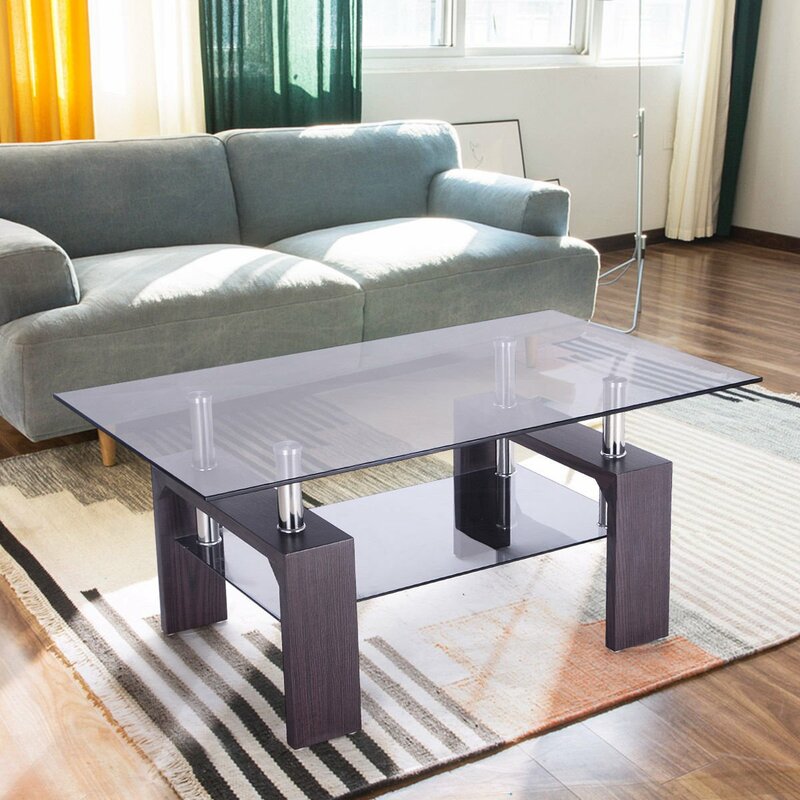 Merax coffee table boasts a unique design with a shatter-resistant tempered glass with a reflective highlight. If you are looking to decorate your interior with something really eye-catching, then this coffee table could be the right one. So there you have our cheap coffee table reviews! 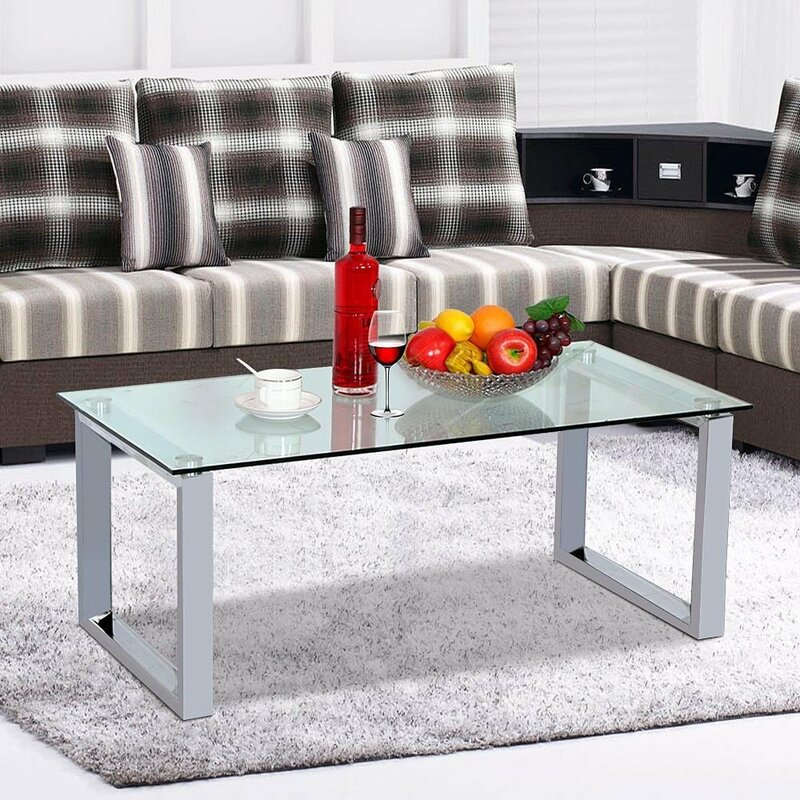 We examined plenty of coffee tables from online retailers, so there should be one among them that would be the best option for your requirements. If you don’t quite know what you are looking for, then keep our small buying guide in mind. 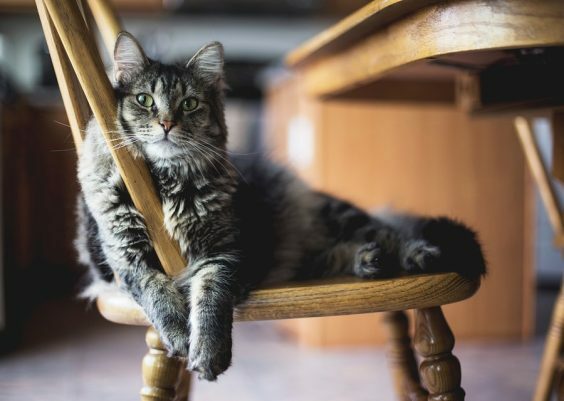 You pretty much need to take into account every single component of the table from its legs to its color and shape, so make sure to be thorough. Your new coffee table should fit your current interior in terms of its design so it doesn’t look out of place and make your room chaotic. 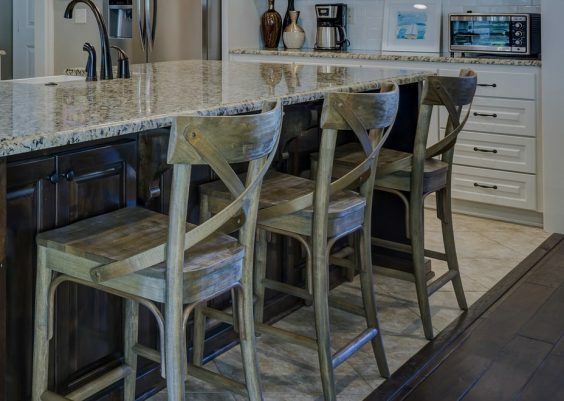 This isn’t a strict rule, and you are free to do anything you want with your interior, but matching the furniture is a general rule that you might want to follow. Besides, don’t forget what you are getting a coffee table for. Don’t get confused and buy a decorative table if you need functionality rather than looks, and vice versa. And in the end, if you liked one of the reviewed coffee tables, then you probably should go and get it!